Despite having temperatures in the 90's last week, I wanted to celebrate the coming of Fall. Some of our trees have already lost their leaves and some are just starting to turn colors. I was in the mood to bake, so we tried making a new recipe. What goes better with Fall than apple cider? Apple cider donuts! DM TIP: I used Wilton's Donut pan, which turned out well. It has space for 6 donuts. I was able to get 14 donuts out of the recipe below. Norpro has a 6 and 12 space donut pan as well. 2. Spray donut pan with a non-stick spray and set aside. 3. In a bowl, mix together flour, baking soda, baking powder, nutmeg, cinnamon, and salt. 4. In a separate bowl, mix together sugar and butter until combined. 5. Add egg and vanilla to sugar/butter and continue mixing. 6. Next, stir flour mixture into the sugar/butter/egg mixture. 7. Add in buttermilk and mix together. 8. Finally, add in apple cider and mix until it is just combined. 9. Fill donut pan about 1/2 full and baking for 8-10 minutes, or until golden brown. 10. Remove from oven and flip onto a cooling rack. 11. Mix the remaining cinnamon and sugar for the topping. 12. 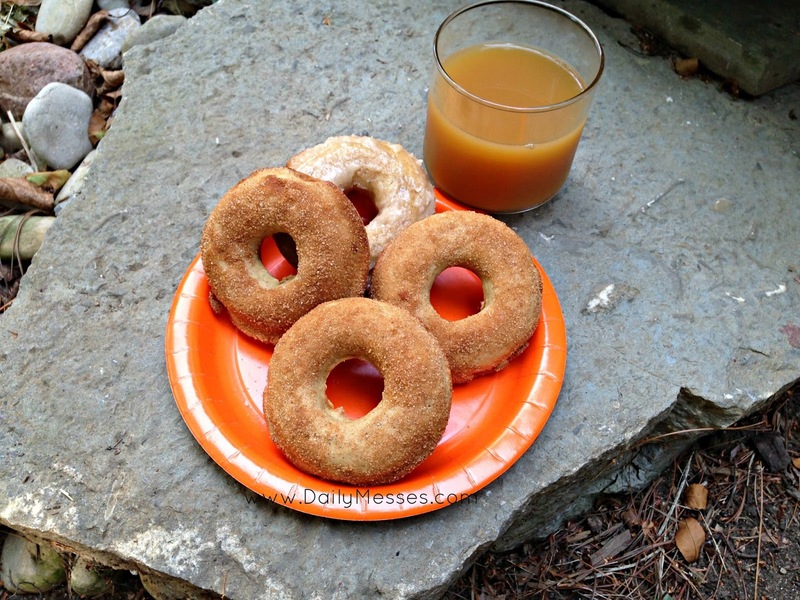 Once the donuts have cooled enough to touch, brush apple cider over the top and sides. 13. Dip donut into the cinnamon/sugar mix. DM Alternatives: You could also dip the cooled donuts in an apple cider glaze (whisk together 1 cup powdered sugar and 2 tablespoons apple cider). You could also sprinkle cinnamon/sugar on top of the glaze. Those sound delicious! I will definitely try them.